Mexican style tacos is exactly what Lucy wanted for her birthday - to create a multi coloured feast and a damn good tequila cocktail. The one that we have in mind is our frozen blackberry margarita with smokey jalapeño tequila. As we are celebrating we are going all out and using seared fillet of beef because it's a treat, and if you can't on your birthday then when can you (if on a budget totally fine to go for a cheaper cut, just make sure it's not too fatty). The fun thing about tacos is all the exciting extras that go with it. We usually also make hot cheesy, spicy quesadillas, grilled corn on the cob, guacamole, chipotle mayo and mango salsa. We are yet to find good store bought guacamole (exception of wholefoods which is good but seriously pricey) so suggest making your own, you can, however, get away with buying salsa, but if time permits then it's supper easy to whiz some up yourself. You also want to have bowls of little gem lettuce leaves, jalapeños, sour cream, tortilla chips and hot sauce. There is an amazing Mexican website called www.mexgrocer.co.uk where you find every authentic Mexican ingredient that you can imagine, every time we go on we end up going wild and seriously over ordering. Pretty much everything can be prepared in advance, something we strongly recommend doing when having a party – there is nothing worse than being glued to the stove in a stress when your guests arrive. You also want to take the presentation into account, mix it all up with different sized and coloured bowls and dishes spread across the table, then leave it up to your guests to customise their own tacos. 1. First, make the mango salsa – combine all ingredients in a small bowl and put aside 2. To make the green sauce – whiz all the ingredients in a food processor, season and put aside 3. Prepare the tacos – in a small bowl mix together the avocado and lime and season. I a separate bowl combine the remanding vegetables. 4. Heat a griddle pan on a high heat till smoking. Season the beef with a little olive oil, salt and pepper then place it on the griddle pan. Cook the beef for about 2 ½ mins the flip and cook for a further 2 ½ minutes. Prod with your finger, if soft it's rare, if bouncy medium rare – cook to your preference. Take off the heat and leave to rest for 3 minutes then finally slice. 5. While the beef is resting heat up your tortilla, we either whack ours on a hot pan or straight on the top of the aga. Once slightly toasted take off and place on plates or wooden board. 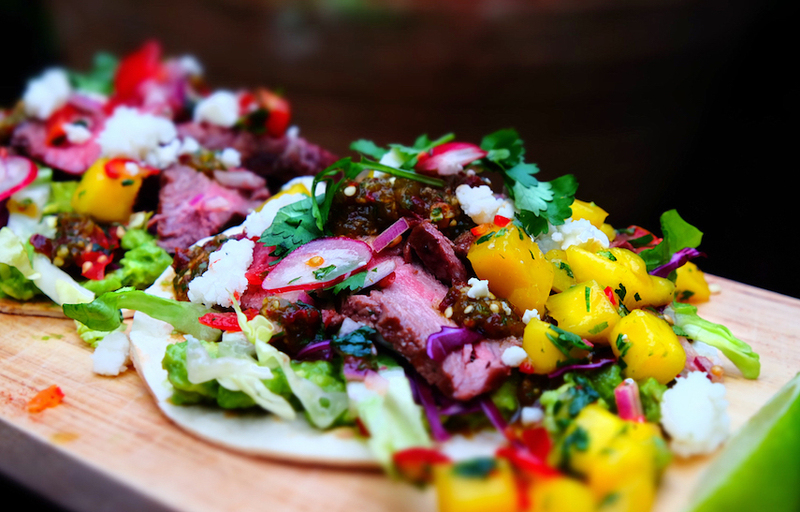 First spread the avocado mixture on tortilla, then add the salad mixture and a little tomato salsa, then arrange the slices of fillet of beef. Finish by sprinkling over the mango salsa, green sauce, crumbled cheese and coriander. Tip – if making for numbers at a party, use a round cookie cutter to cut out smaller tortilla rounds rather than having huge ones.